distribution Scattered over the mountains and Piedmont, with a gap (probably due to collecting effort) in the west-central portions of the Piedmont. Might well occur in all counties in the two provinces, as it ranges east to Halifax, Wake, Harnett, and Scotland counties. Probably occurs on very rare occasions in the Sandhills portion of the Coastal Plain. abundance Declining in recent years, with shockingly no records in 2017 or 2018. Less numerous in NC than Selys's Sundragon in most counties where both occur (i.e., the eastern Piedmont). Very uncommon to unncommon in the eastern third of the Piedmont, but seemingly quite rare westward, with most records in the western part of the state lying close to the Blue Ridge escarpment. The gap of records in the west-central Piedmont is bizarre and suggests that the species must be very rare there, but as there are many records from the foothills and from the eastern Piedmont, it certainly ought to be present in all Piedmont counties. flight Somewhat similar to Selys's Sundragon, though occurring later into early summer. In the Piedmont, from very late March or early April to late June, but scarce after early May. Dates in the mountains fall between mid-April and late June, and the single Coastal Plain record is for mid-April. habitat Creeks and slower-flowing rivers, in shaded or semi-shaded forested areas. Apparently in slightly larger bodies of water than for Selys's, but habitat certainly overlaps. behavior Males patrol territories over creeks and rivers, but fly longer and faster patrols than does Selys's. 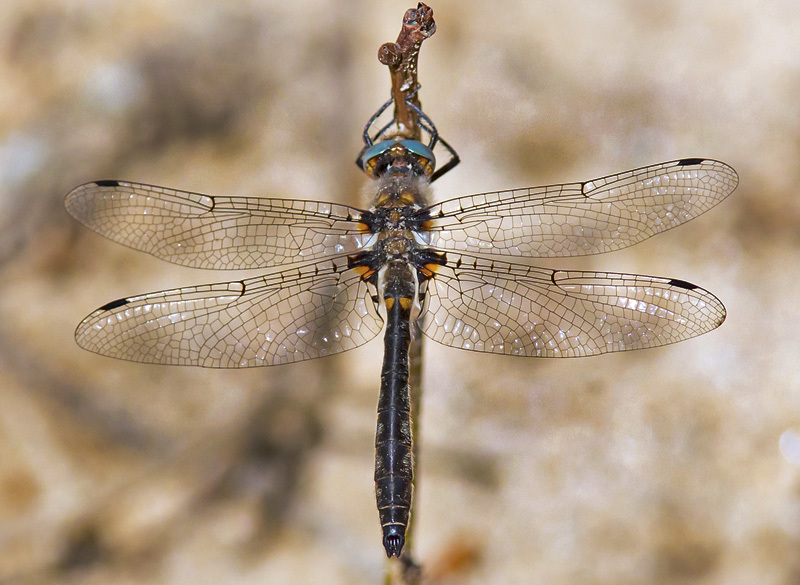 Adults are like most baskettails and Selys's Sundragon in foraging well away from water along trails and roads, perching for easy observation. comments Though this species has a wider, more Northern, range than does Selys's, it is the less common of the two in NC, though active observers in the eastern Piedmont might see one or two Uhler's each spring. The two sundragons are quite similar in appearance, with Uhler's having a small amber spot (lacking in Selys's) at the base of each wing; these spots can be difficult to see in the field, but good, close photographs show the mark well.